Korea Racing Authority partnership will see Sky Racing World offering simulcast wagering from Seoul and Busan races to ADW’s across the Americas and Europe. Louisville, July 6th, 2017 – Sky Racing World, the Louisville, Kentucky-based distributor of international horse-racing content and subsidiary of Australian wagering operator Tabcorp, has partnered with the Korea Racing Authority (KRA), South Korea’s sole racing authority. Under the partnership, Sky Racing World will distribute horse-racing content from the KRA-operated LetsRun Park Seoul and Busan-Gyeongnam tracks to advance depositing wagering (ADW) sites throughout the Americas and Europe, from August 3rd, 2017. Distributed via the Roberts Communications with a race call in English, Sky Racing World’s Korean racing content will be simulcast 50 weeks a year. On Thursday and Saturday nights EDT/PDT, races will be simulcast from the KRA’s LetsRun Park Busan-Gyeongnam in the country’s second largest city, and from the capital’s LetsRun Park Seoul track on Friday and Saturday nights EDT/PDT. The Korean races will be simulcast from approximately 9:45 p.m. until 3:30 a.m. EDT (6:45 p.m. PDT to 12:30 a.m. PDT). With all of the three best-ranked thoroughbreds in Seoul and Busan bred in the Sky Racing World’s ADW partners will offer wagering on Korean racing to their customers from Thursday evening EDT/PDT, August 3rd, 2017. ADWs will be able to offer their customers a range of bets on these and subsequent Busan and Seoul races. These include win, show/place, exacta, trifecta, pick 3, pick 4, and superfecta. Free past-performance data on the fields in Korean races will be available on Sky Racing World’s website and from Equibase. The South Korean racing schedule will continue weekly through August before reaching its summer climax on Saturday, September 9th 2017, with the second annual G1 Keeneland Korea Cup. This 3-year-old and up race with a purse of 1 billion KRW ($877,000) runs over 0 at LetsRun Park Seoul. The day also features the G1 Keeneland Sprint, a 700 million KRW ($614,000) race for 3-year-olds and up over 0. For more information on Sky Racing World’s Korean racing product, please contact Sky Racing World. Founded in 2014, Sky Racing World is the exclusive North American distributor of thoroughbred and harness horse-racing from races taking place across Australia, New Zealand and South Africa. The company, a subsidiary of Tabcorp, Australia’s biggest wagering and entertainment company, provides Australian, New Zealand and South African racing content for simulcast horse-racing wagering to over 70 US-facing advance deposit wagering (ADW) brands, including TVG, NYRA Rewards, TwinSpires.com, Xpressbet.com and BetAmerica.com. In addition, Sky Racing World provides Australian racing content for simulcast horse-wagering wagering to over 425 horse-racing tracks and off-track betting (OTB) outlets in USA, Canada, Mexico and the Caribbean. 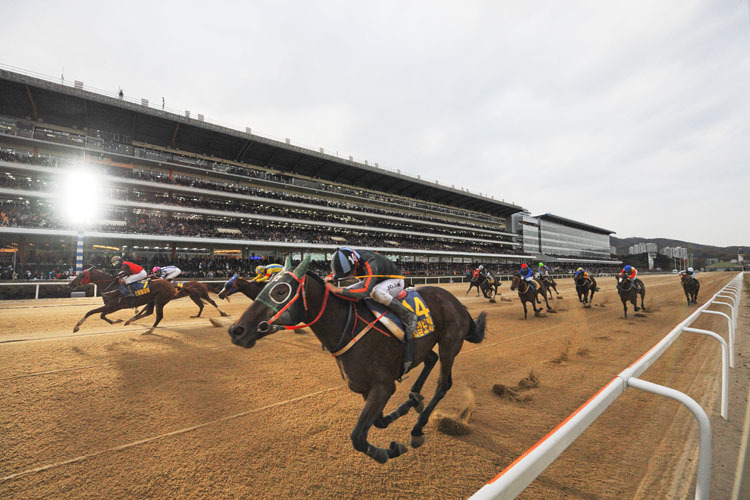 Korea Racing Authority (KRA) is the sole horse-racing and wagering authority in Korea by KRA law, with the first horse-racing dating back to 1920s. KRA operates three race tracks in total, two thoroughbred tracks in Seoul and Busan-Gyeongnam, and one native pony racetrack in Jeju. KRA runs 280 race meetings and 2,700 races annually taking place every Friday, Saturday and Sunday (Thursday, Friday and Saturday in North America).